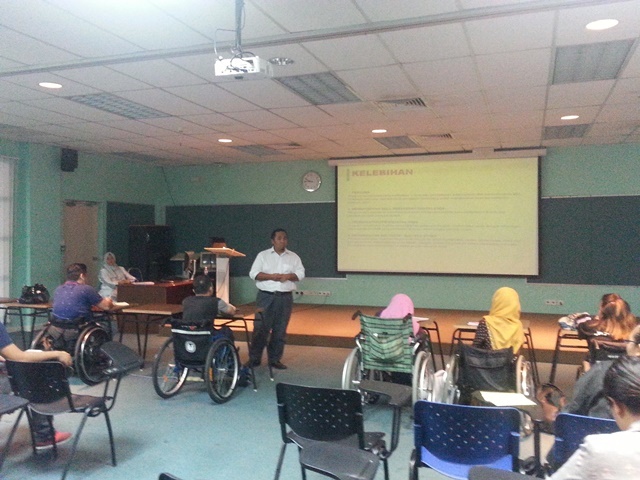 THURSDAY, 21 JULY – The e-Entrepreneurship Course organised by the Psychology and Social Health Research Unit (UPPsiKS) Universiti Malaysia Sabah (UMS) was able to assist People with Disabilities (OKU) to learn digital entrepreneurship in marketing hand-made products, thus helping to generate good income. According to UPPsiKS Head, Dr. Ferlis Bullare, this course enabled participants especially OKU to learn digital income generation through product marketing techniques on social network sites. “It also seeks to apply the knowledge and digital entrepreneurship amongst existing micro entrepreneurs and the public who wish to pursue entrepreneurship,” he said. He added, some OKU participants brought in some interesting products, which had good potential to enter the market. “The products were of good quality and able to penetrate into the market, but they lacked the knowledge on effective marketing strategy that could generate revenue for them. “Hopefully this course could bring benefit to them to expand their potential in their respective fields,” Dr. Ferlis added. He said, it was the hope of the organisers that this programme achieve the goal of human development thus increasing the economic welfare of the people especially in the field of entrepreneurship amongst the OKU and general public. Held at the Seminar Room of the Faculty of Psychology and Education, the course organised in collaboration with Yanzz Excellence Services and JNJ Management & Consultant was attended by more than 50 people including 20 persons with disabilities.